The young string quartet, the Gildas Quartet (Christopher Jones, Gemma Sharples, Kay Stephen and Anna Menzies) brought a programme with a twist to Conway Hall on Sunday 14 May 2017. They performed Haydn's String Quartet in G Op.77 No. 1, Janacek's String Quartet No. 1 'Kreutzer Sonata', and Frank Bridge's String Quartet No. 4 in regular concert format. Then after a short break for the hall to be re-configured the audience was invited to return and the quartet repeated the Janacek, but this time in collaboration with John Landor's Music in Motion so that the musicians performed without music or music stands, and wandered amongst the audience using gesture to dramatise the music. Haydn's Opus 77 quartets represent the interface between Haydn's development of the string quartet medium and his brilliant, but abrasive, pupil Beethoven's extension of it. Haydn was commissioned for six quartets from Prince Lobkowitz, but only two have come down to us and we also have Beethoven's Opus 18 string quartets which date from around the same time and which are also dedicated to the prince. Given the poor relationship between the two composers, it is not quite clear what happened. By 1799 Haydn was 67, but still capable (he wrote a full scale orchestral mass in 1802), though undoubtedly the Opus 77 quartets have a retrospective quality, not so much autumnal but a looking back at techniques and a summation. The opening Allegro moderato was crisp, brisk and characterful with the players bringing out the humour of the piece. At first it seemed very violin led, with some lovely playing from Christopher Jones, but Haydn developed a more balanced texture and there were some nice violin and cello dialogues. The Adagio was gently wistful, with a sense of nostalgia yet with an edge to it; there was an element of uncertainty too, a sense of questioning. The minuet was full of humour, and played with vigour, with a trio which contrasted between robust and delicate moments. The finale was a toe-tapping dance with scurrying passagework which they took at quite a lick. There was the odd sign of the players taking time to settle in, the occasional smudged detail but overall this was a performance full of verve and engaging energy. Janacek's first string quartet is based around Tolstoy's novella The Kreutzer Sonata though Janacek does not explicitly dramatise the story, instead he evokes the welter of emotions arising from it. The opening movement, Adagio - con moto, was highly atmospheric with great impetus in the music. The players brought a real sense of character to each of the short motivic bursts which characterise Janacek's writing here, full of vibrant details. The second movement, Con moto, was strong, full of energy and intensity. This felt like vibrant, young person's passion. The players gave a striking sense of contrast to the third movement, highlighting the lyricism and violence, the moments of beauty and passages of harsh tone as well as contrasts in dynamics. The final movement opened quietly bleak yet lyrical, growing in intensity and impetuousness to the astonishing final passages which evaporate at the end; gripping stuff. This vivid performance really gave a sense that the players had constructed their own emotional narrative to the piece, which underlay their vibrant performance. After the interval we heard Frank Bridge's String Quartet No. 4, written in 1937. It is one of a group of late works where Bridge's interest in contemporary European music, notably the Second Viennese School, is apparent, setting him very much apart from the majority of his British contemporaries. The opening movement used very angular melodic material and created a sense of anger and anxiety, yet there was lyricism too, and later on some very lush moments. It was also a very contrapuntal piece, with four really independent lines. After much passionate dialectic, the movement ended quietly. The players navigated the work's technical and emotional difficulties to give a very eloquent performance. The middle movement opened with a feeling of Haydn-esque wit in the four characterful lines, but this developed into something more intense and ended up in the air, with all four players high in their register. The third and final movement started from a unison phrase full of impassioned lyricism, but suddenly fast and vivid with the suggestion of a waltz underlying the rhythm. The players performed with real verve and commitment, a belief in this terrific work. For the Music in Motion performance of Janacek's String Quartet No. 1 we were seated in more casual fashion, with some people lying on the floor and the players performing amongst us. 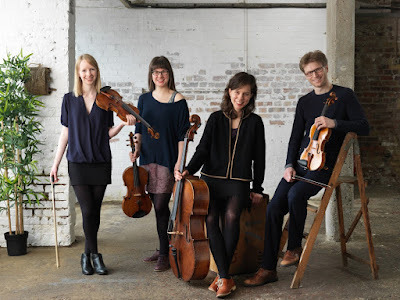 The cellist, Anna Menzies, remained stationary but the other three players moved around and their position and gestures responded to the drama and musical argument. The result was extremely vivid and engaging, creating a real sense of our dramatic involvement in the piece and was certainly popular with the audience.